3rd generation flight feathers. In general these are adult-like birds, with obvious immature markings. Ageing can be difficult at this age, especially between 3rd cycle and 4th cycle birds. Immature birds with extensive black in the tail and extensive brown wing-covert patches should normally also be in 3rd cycle. However, advanced 3rd cycle and retarded 4th cycle birds are extremely similar, and such birds are probably best labelled "sub-adult". Below you will find a description of Chapter 30. 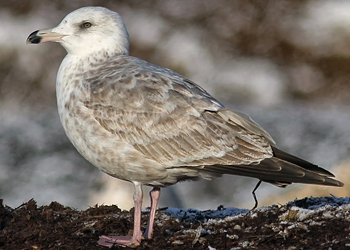 SLATY-BACKED GULL, as published in one of the best Gull publication: "Gulls of the Americas" by Steve Howell & Jon Dunn. 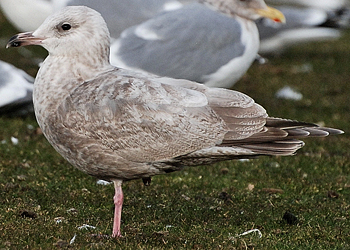 Note overall size and structure, bill size and shape, two-tone pattern of outer primaries, slaty gray incoming feathers on back. Slaty-backed Gull (schistisagus) 2nd cycle (2CY), December 26 2013, Cape Nosappu, Hokkaido, Japan. Picture: Ian Davies. Pale iris in this bird, much dark in tail. Strong pink, short-looking legs. Slaty-backed Gull (schistisagus) 2nd cycle, December 25 2013, Shibetsu Harbor, Shibetsu, Hokkaido, Japan. Picture: Ian Davies. Upperpart grey tone shining through as the new feathers grow in. Much dark in tail. Note overall very simple pattern on wing-coverts and tertials, lacking any notching (no post-stamp edges). 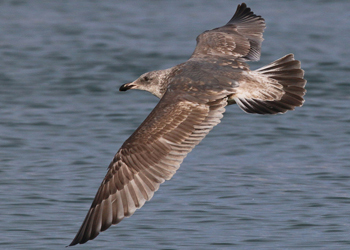 VEGA GULL and AMERICAN HERRING GULL often more boldly barred on upperparts in fresh B2 with incoming medium (Vega) to pale (American Herring) gray on upperparts; inner primaries contrast more abruptly with blacker outer primaries, which lack strong two-tone pattern of Slaty-backed. 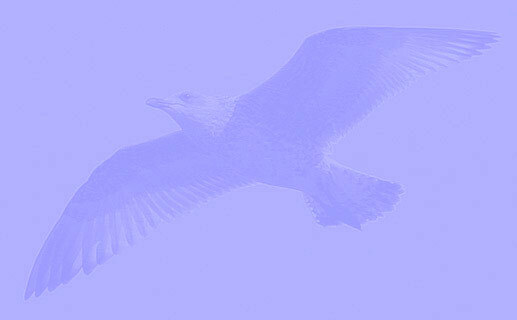 above: 4x Vega Gull (vegae) 2nd cycle, December 27 2009 - January 04 2010, Choshi, Japan (Chris Gibbins). 2nd gen flight feathers, sometimes with faint mirror on P10. 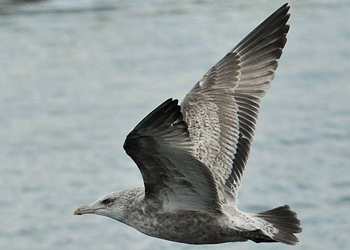 Often thin vermiculation at the tops of innerwebs of P2-P4, similar to Herring Gull. Very pale on rump and proximal half of rectrices. Markings on undertail coverts widely spaced. 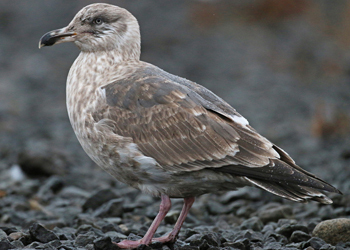 American Herring Gull 2nd cycle, December 12 2013, Tompkins Co, NY (Kevin McGowan). 2nd gen flight feathers, and most coverts also 2nd gen. Still no grey scaps. Limited partial autumn moult, 3rd gen coverts much 2nd gen-like patterned. American Herring Gull (smithsonianus) 2nd cycle, December 08 2012, Lake County, IL (Amar Ayyash). Classic 2nd cycle plumage with pale panel on inner primaries, and mostly dark outer primaries. 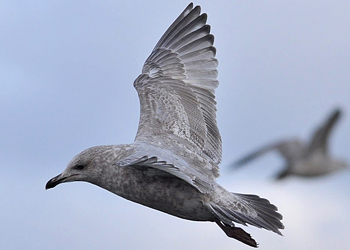 THAYER’S GULL paler overall with incoming back feathers pale gray. Wing and tail patterns similar to Slaty-backed but tail less blackish, and dark/light contrast on outer primaries averages stronger at shaft. 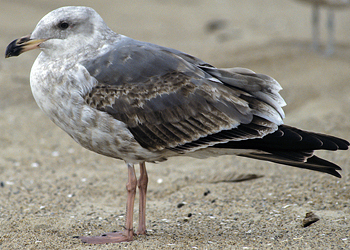 WESTERN GULL has more-uniform and darker upperwings with poorly contrasting pale inner primaries, lacks two-tone outer primaries of Slaty-backed. 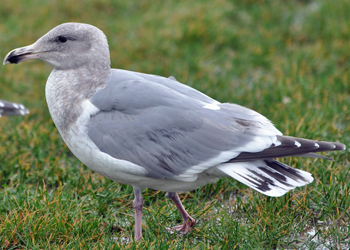 HYBRID GLAUCOUS-WINGED GULL X AMERICAN HERRING GULL has blackish to dark brown wingtips and tail, incoming pale gray on upperparts. Field characters need study. 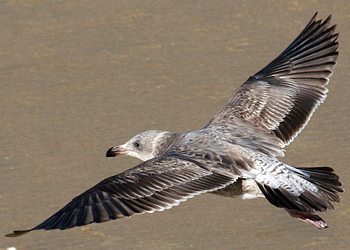 HYBRID GLAUCOUS-WINGED GULL X WESTERN GULL has more-uniform and often darker upperwing coverts, but primary pattern might approach Slaty-backed; incoming gray on upperparts paler (Kodak 6-8), wings and tail blackish to dark brown. Differences from Vega Gull, Western Gull, and hybrids much as adult cycle (which see); note wingtip pattern, bill size and shape, tone of upperparts, leg color.